Shadow Black 2016 Ford F-250SD Lariat 4WD TorqShift 6-Speed Automatic with Overdrive Power Stroke 6.7L V8 DI 32V OHV Turbodiesel 4WD. Must present ad prior to negotiation with approved credit. Tax, tag, dealer fee. Rims are optional on specific units. For internet price MUST ask for internet manager. Apr as low as 3.99 % wac bad credit no problem. Thank you for visiting our Michael's Auto Sales website, including our mobile device-ready version. 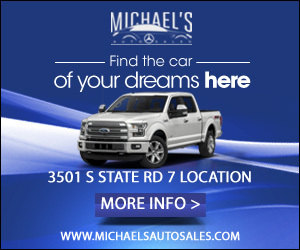 Michael's Auto Sales and our affiliates (together, "Michael's Auto Sales" or "we") strive to make our website a useful tool and a rewarding experience for our customers by tailoring the content to your personal needs and interests. This way, the content of our website will be as relevant as possible for you, the customer. We hope that you find our website to be a useful part of your car-buying experience. What personally identifiable information is collected by Michael's Auto Sales or by any third party through our website; How Michael's Auto Sales uses this information; With whom Michael's Auto Sales may share this information; What choices are available to you as a user of our website with respect to collection, use and distribution of the information; and What types of security procedures are in place to protect the loss, misuse or alteration of information under our control. Michael's Auto Sales collects two different types of information through our website: anonymous information and personally identifiable information. Michael's Auto Sales partners with third-party advertising company Google to collect information about how users navigate our website and we use many or all of their products to enhance our website experience. Like Michael's Auto Sales, Google is very much committed to consumer protection, to maintaining the privacy of your personal information and to making ads safe, unobtrusive and relevant for you. To help us manage our advertising and website, Google offers many products in addition to Google Analytics, including Google’s Analytics for Display Advertisers, AdSense, AdWords, and a range of DoubleClick-branded services. Michael's Auto Sales participates in an integrated version of Google Analytics and DoubleClick products or services and/or other Google display ad products or services, known as Google Analytics for Display Advertisers. As with Google Analytics, you can learn more about Google Analytics for Display Advertisers, or you can opt out, by going to https://tools.google.com/dlpage/gaoptout. Michael's Auto Sales does not sell, rent, or share personally identifiable information to or with any third party not affiliated with or owned by Michael's Auto Sales, except service providers who may assist us in such areas as our promotions, credit checks, data storage and order processing (See Agents and Vendors below). Michael's Auto Sales will never give or sell your personally identifiable information to unaffiliated third parties to be used for the purposes of sending you unsolicited commercial offers, such as spam. We may, however, use your personal information to send you commercial offers in e-mails from Michael's Auto Sales or its affiliated companies, which do not relate to the products or services you have ordered. You may altogether avoid or opt out of these marketing campaigns (see "Opting Out" below). Michael's Auto Sales takes commercially reasonable precautions to protect your personally identifiable information. For example, we encrypt communications through our website with commercial strength encryption generally used by our industry. However, given the nature of the Internet and the fact that network security measures are not perfect, we cannot guarantee the absolute security of your information. If we are required to provide notice to you of a data security breach, the notice will be provided in electronic form. I certify that all information contained herein is true to the best of my knowledge. By affixing my name below, I certify that I am the person submitting this application and I authorize Michael's Auto Sales to process this information by running a credit inquiry. This inquiry will be for the purpose of qualifying for auto finance.